A statue commemorating the life of the suffragist, Millicent Fawcett, has been unveiled opposite Parliament. She campaigned for women’s right to vote during the early 20th Century and is seen as one of the most influential feminists of the past 100 years. Prime Minister Theresa May paid tribute to the "truly great" campaigner’s "lasting impact" after it was unveiled. The bronze casting, by the artist Gillian Wearing, is the first statue of a woman erected in Parliament Square. 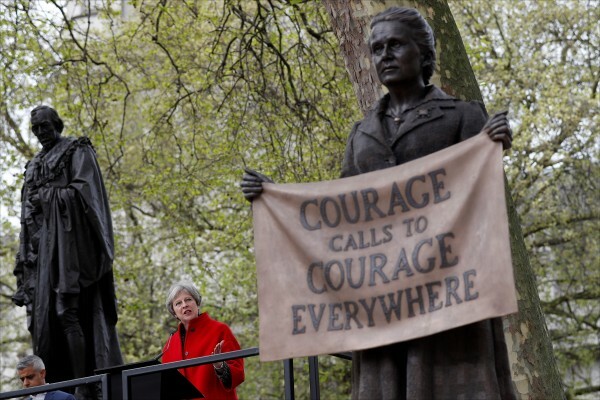 It features her holding a banner reading "courage calls to courage everywhere" and was commissioned as part of this year’s centenary of the 1918 Representation of the People Act - which gave some women over the age of 30 the vote. The 11 existing statues in Parliament Square are of Nelson Mandela, Abraham Lincoln, Mahatma Gandhi, former prime minister of South Africa Jan Smuts and former British prime ministers Sir Winston Churchill, Sir Robert Peel, David Lloyd George, Viscount Palmerston, Earl of Derby Edward Stanley, Earl of Beaconsfield Benjamin Disraeli and George Canning.